The Musée national de Préhistoire provides an excellent overview of the history of this area. Housed in a new building adjacent to the ancient fortress, the Musée national de Préhistoire dominates the village of Les Eyzies. The views of the river valley from the museum are impressive. The museum contains thousands of artifacts and exhibits that illustrate the life of hunter-gatherers in the Paleolithic period and through the time of the glaciers. Stone and flint tools, works of art, arrowheads, and reconstructions of prehistoric men and animals are featured. The collection was begun in the early 20th century and has grown to include over 6 million objects. The museum focuses on the Paleolithic era, the history of the Neanderthals and Cro-Magnon man. Exhibits present cultures as old as 400,000 BCE. The area around Les Eyzies and Lascaux is so rich with history that a visit to the museum can help provide a context for all that you are seeing. 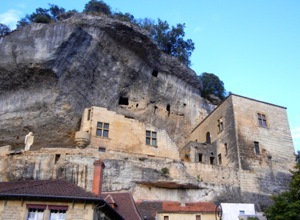 Above, The Musée perched on the cliffs above the town of Les Eyzies. 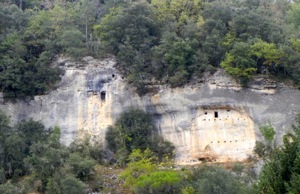 Below, Dramatic landscape and cave dwellings around Les Eyzies.